A POW block house is a great idea! Hey there Wii U owner. Remember when Minecraft: Wii U Edition became one of the top selling games on the system? Nintendo and Microsoft are aiming to keep that momentum going by releasing a retail copy of the game bundled with a bunch of skin and texture packs. Same price as the download, only now you get a glossy box, too! 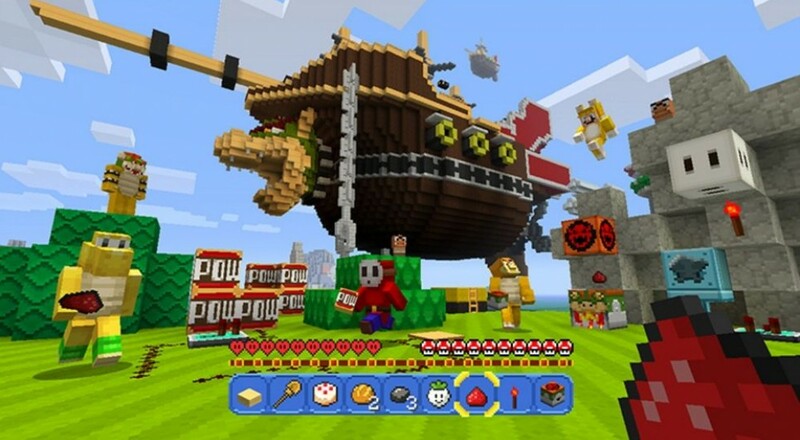 Nintendo's Wii U has only had its version of Minecraft for a few months. The digital release happened last December, bundling a ton of skin packs with the belated download. Then in May the inevitable Super Mario texture pack was released, grabbing 40 Mario skins from Super Mario World, Super Mario 64 and Super Mario Sunshine along with 15 tunes from Super Mario 64. And yeah, Peach, Luigi and Bowser were along for the ride, too. Both online and local co-op are supported on Minecraft Wii U. Local supports two players with splitscreen, while online lets as many as eight join together for good clean castle building. You can also go it solo with Off-TV Play, just in case you're too lazy to look for the remote. Page created in 0.8171 seconds.